STEVE EVANS has vehemently defended his position as head coach of Leeds United, with the Glaswegian suggesting the Whites would be in a relegation dogfight without his three key signings. United’s season all but petered out for good with Saturday’s 1-0 loss in the FA Cup fifth round at Watford, with 17th-placed Leeds 11 points clear of the dropzone but 16 points off the play-offs ahead of Tuesday night’s home game against Fulham. But Evans has asked the club’s fans to question exactly where Leeds would be without the three players the Glaswegian recruited in the January transfer window in Toumani Diagouraga, Mustapha Carayol and Liam Bridcutt, the latter having initially arrived on loan in November. Evans had also hoped to bring in further attacking recruits to a side who have now not scored in five hours and 21 minutes of football. United have scored just 12 goals in 16 games at Elland Road this season, the second-worst home goalscoring record in the Football League with only League Two’s basement club Dagenham & Redbridge faring worst. But Evans says he has been hit hard by the continued injury woes experienced by main striker Chris Wood, although he is nonetheless sure United are in a better state now than when Uwe Rosler was sacked in October. A passionate Evans said: “The one thing that I don’t forget is that when I first accepted the job at Leeds United, I had one remit from the owner - to stay up. “Because everyone, including a lot of Leeds United supporters who I have known for years, thought they were going down. “This is a question for the Leeds fans, of which I am one, but I am not answering the question myself as I am not that silly. “But without Digaouraga, without Bridcutt and without Carayol coming in, do they think we would be a in a relegation fight come the end of the season? “I have only brought three players in and have they improved us? The answer is by some distance. “Without Bridcutt and Diagouraga alone, would we have been involved in a relegation fight? And I think the president’s answer is yes because he moved Uwe out, he allowed me to bring them in so he has identified it as well. 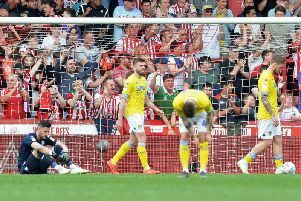 “The Leeds United supporters are phenomenal and they deserve halos, every one of them. “Do they think Diagouraga makes us better? Do they think Bridcutt has made us better? And do they like Carayol? I would say they are three of our better players and that’s the standard of player that I am going to be getting in over the summer and making us a real promotion contender. “If I don’t build a promotion team, and I’m talking top six here, then I won’t be at Leeds and I’ll do that myself. “I won’t need Mr Cellino to sack me. I’ve got too much pride. So back me and I’ll take you into a promotion place, that’s my belief. “I think there will be investment by the owner when we go forward into the summer and I can’t tell what the Leeds United supporters what to do, I am very humbled to work at Leeds United. “But I’m saying, if I get supported, I will put on the pitch a squad of men that will challenge for the Premier League. “If I fail that, I will drive out of Thorp Arch and I will be broken hearted and I will admit failure.